This is an introductory look at setting up a fresh Ember.js App using ember-cli, setting up a few basic templates/routes, and installing/configuring some assets such as Twitter Bootstrap (using SASS) using Bower. I recently came into a situation where I need to accomplish just this and found that the due to Ember’s rapid evolution, many of the articles had become out of date. Which will surely happen to this article as well. Please note this article is using ember-cli v0.1.2, node v0.10.31, and Ember v1.8.1. If you are new to Ember.js, I highly recommend heading over the the Ember docs and Getting Started Guides and spending a bit of time getting to know the framework at least on a high level. If you have any type of Ruby on Rails, Laravel, (or any other similar MVC-ish frameworks that utilize generators and the command line), you will feel right at home :). 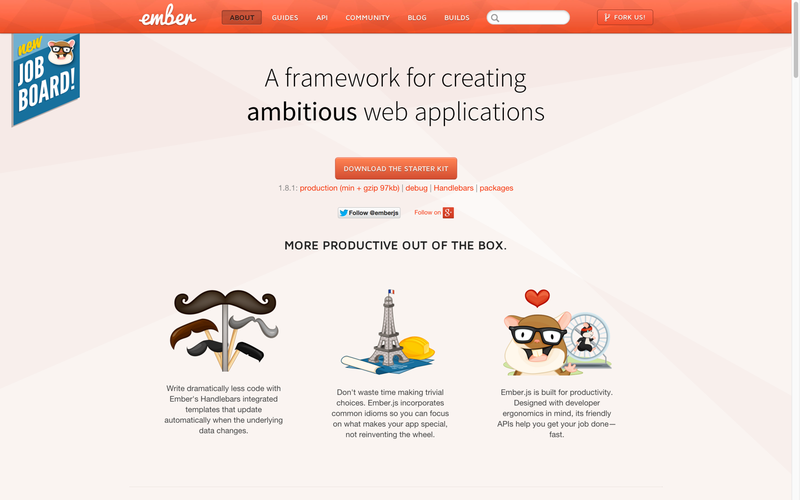 Assuming you are already setup with node, ember (ember-cli), and bower. Recommended: Head on over the my Ember.js w/ Bootstrap (SASS) Example App Quick Start instructions. # Done. See that wasn't so bad, was it? Now you should be able to browse to: http://localhost:4200 and be up and running with Ember.js and Bootstrap 3! If you don’t already have node.js installed on your system, you will need to start here. If you search for “How to install node.js on [YOUR OPERATION SYSTEM]” you will come across 100 different methods on how to do just that. The simplest way is the just head on over to nodejs.org and download the one click installer. Their quick install instructions are pretty straightforward. Just make sure to set stable as your default alias. If you are new to ember-cli, then you will want to head over and checkout the ember-cli Generator docs. Declare the route in your router.js for "/login"
And for good measure, let’s throw in some Bootstrap specific markup so we can verify that the Bootstrap 3 assets (including glyphicons/fonts) are setup correctly. <span class="glyphicon glyphicon-cog"></span> Log Me In! Note: bootstrap-sass is not the bootstrap-sass you are looking for! […] bootstrap-sass is taken so make sure you use the command above. Now you could import directly from the bower_components/[...]/bootstrap.scss, but I like to have a little more control/visibility over my imports (especially since the bower_components’s Bootstrap is not tracked in the git repository). Add a @import "bootstrap_imports"; to the top of your app.scss. Load the page. 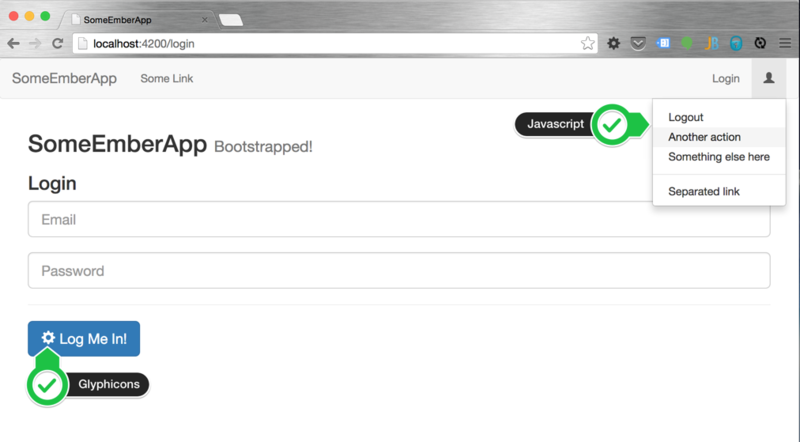 Your new app should be Bootstrap-ified! Step 3c: Start Customizing Bootstrap! Add a bootstrap_variables.scss to declare/override Bootstrap’s defaults. Why? Read this article on !default for an explanation. Any variables you declare in this new file will take precedence over those declared in the deafult _variables.scss included by Bootstrap. I plan to refine and update my Ember.js w/ Bootstrap (SASS) Example App repo as I plan to use it from time to time. By the time you read this, the repo will likely be much more up to date, relevant, and useful. 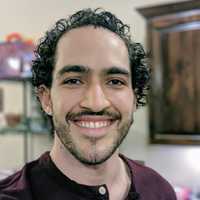 Please let me know of any suggestions/alternatives/resources as at the time of this writing I am fairly new to the land of Broccoli and Ember.js myself!